FBS is an online broker for the Forex market, meaning you can trade currencies using its tools and platforms. It offers multiple trading platforms, tailored account types and generous bonuses to its traders, plus free deposit insurance and training materials. As with all online trading services, please be aware that you may lose, as well as potentially gain, money. Impressive variety of accounts available for trading on Forex markets. We were particularly interested in the impressive variety of accounts available for trading on Forex markets through FBS.com. The Cent account allows new traders to practice their skills, whilst the Micro account supports traders who have an eye for minute details. The Standard account is for more experienced traders, whilst a Zero Spread account allows you to perform quicker trades. Finally, the Unlimited account is designed for top traders with plenty of experience. Each account type requires a different initial deposit, so it all depends on your approach and how much money you have to deposit. Several trading platforms are also provided, including MetaTrader 4 and 5. You can therefore trade using Mac iOS, Windows or mobile device. We were also impressed by the online trading calculator, which offers a lot of useful options to help you work out profit and loss. An easy to use trading calculator allows you to work out potential profit or loss. 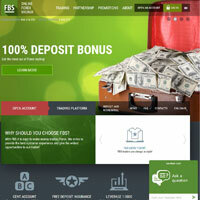 Another benefit of FBS is that they offer bonuses for opening accounts or making deposits. In fact, this has been voted the “World best bonus program on Forex 2014”, so, if you’re looking for options to trade on the Forex markets, FBS seems like a good option. That said, there are no other markets available, so it can be somewhat limiting if you were planning on building a diverse portfolio using a single service. Let’s consider the site’s Forex options in a bit more detail. As well as deposit bonuses, free deposit insurance, a choice of accounts and trading platforms, you can also learn to better understand the Forex market. Seminars, articles, blog posts, news articles and a variety of tools can help you to develop your trading techniques. Their partnership program also provides commission payment options and monthly rewards, gifts and contests. Analytics (on FX Bazooka) is a useful resource to find out about potential shifts in currencies, and the site is always improving on its payment options. Whilst you may be a little limited in terms of market variety on FBS.com, they do Forex trades in style. There are multiple accounts to choose from, each of which suits a different trading style and deposit amount, plus plenty of opportunities to learn about trading in the form of online content and seminars. With generous bonuses for new and existing members, the site is certainly worth considering if you’d like to trade currencies.